Innovations in court practices to respond to the over-representation of Indigenous people in the criminal justice system and to provide more culturally appropriate forums in which Indigenous offenders can more fully engage and understand the justice process to which they have been subjected, have been introduced in Australia, New Zealand, Canada and the USA in various forms. This chapter begins exploring the theoretical frameworks and political movements that might explain the emergence of such innovative processes. It draws together a number of reports, articles and chapters that have described the evolution of innovative Indigenous justice practices that been adopted in the USA, Canada and New Zealand, providing an account of why there was a need for these new justice practices and how they were established. 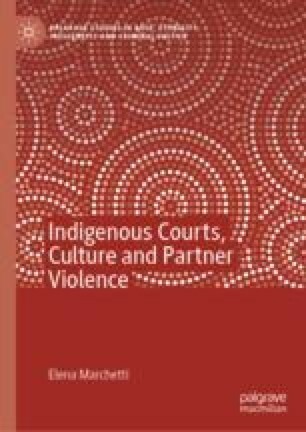 The second part of this chapter focuses on the debates that discuss whether or not ‘informal’ or innovative justice practices, including culturally appropriate sentencing practices, are appropriate for responding to Indigenous partner violence. Australian Law Reform Commission (2010) Family Violence—A National Legal Response. Final Report 114 Volume 1. Sydney: Australian Law Reform Commission. Available at: https://www.alrc.gov.au/publications/family-violence-national-legal-response-alrc-report-114. Davies, L., Whaanga, J. and Kaipuke Limited (2012) Evaluation of the Early Outcomes of Ngā Kooti Rangatahi: Submitted to the Ministry of Justice. Wellington: Ministry of Justice. Available at: http://litmus.co.nz/wp-content/uploads/2015/11/Evaluation-of-Nga-Kooti-Rangatahi-FINAL-report-17-December-1.pdf (Accessed: 20 November 2018). Department of Justice (2016) Aboriginal Justice Strategy. Ottawa: Government of Canada. Available at: http://www.justice.gc.ca/eng/fund-fina/acf-fca/ajs-sja/ajs-sja.html (Accessed: 13 June 2018). Flies-Away, J. T., Gardner, J. and Carrow, C. (2014) Overview of Tribal Healing to Wellness Courts. West Hollywood: Tribal Law and Policy Institute. Available at: http://wellnesscourts.org/files/THWC%20Overview%20Final%20-%20Sept%20%202014.pdf (Accessed: 20 November 2018). National Criminal Justice Reference Service (2001) Circle Sentencing. Juvenile Justice Bulletin: National Criminal Justice Reference Service. Available at: https://www.ncjrs.gov/html/ojjdp/2001_2_1/page4.html (Accessed: 25 November 2015). CBC News (2018) ‘Ottawa’s Indigenous Peoples Court Shows Some Early Success’, CBC News. Available at: http://www.cbc.ca/news/canada/ottawa/indigenous-peoples-court-ottawa-1.4573417 (Accessed: 13 June 2018). Taumaunu, H. (2014) ‘Rangatahi Courts of Aotearoa New Zealand—An Update’, Māori Law Review (November). Available at: http://maorilawreview.co.nz/2014/11/rangatahi-courts-of-aotearoa-new-zealand-an-update/ (Accessed: 14 June 2018). The District Court of New Zealand (2018) Ngā Kōti Rangatahi o Aoetearoa: News, Stories and Events from the Rangatahi Courts and Pasifika Courts Issue 10, Maehe 2018. Auckland: The District Court of New Zealand. Available at: http://www.districtcourts.govt.nz/assets/Uploads/Court-in-the-Act/Rangatahi-Court-Newsletter-Issue-10.pdf (Accessed: 14 June 2018). The Judicial Branch of the Navajo Nation (2004) Peacemaking: A Guide to the Peacemaking Program of the Navajo Nation: Judicial Branch of the Navajo Nation. Available at: http://www.navajocourts.org/Peacemaking/peaceguide.pdf (Accessed: 15 June 2018). The Judicial Branch of the Navajo Nation (2018a) Courts and Peacemaking in the Navajo Nation: A Public Guide: Judicial Branch of the Navajo Nation. Available at: http://www.navajocourts.org/Index.htm (Accessed: 15 June 2018 2018). The Judicial Branch of the Navajo Nation (2018b) History of the Courts of the Navajo Nation: Judicial Branch of the Navajo Nation. Available at: http://www.navajocourts.org/Index.htm (Accessed: 15 June 2018). Tribal Law and Policy Institute (2003) Tribal Healing to Wellness Courts: The Key Components. West Hollywood, CA: U.S. Department of Justice, Office of Justice Programs. Available at: https://www.ncjrs.gov/pdffiles1/bja/188154.pdf (Accessed: 20 June 2018). Whonnock, K. (2008) Aboriginal Courts in Canada: The Scow Institute. Available at: http://scow-archive.libraries.coop/library/documents/Aboriginal_Courts_Fact_Sheet.pdf (Accessed: 25 November 2015).